The 200 Series is without a doubt one of the best tow vehicles on the market and consequently one of our most popular builds. There is little doubt in anyone’s mind that one of these big wagons should be on the TJM shopping list. The bar work available on the new face-lift 200 series is some of the best-looking gear TJM has made so having some available on a vehicle for people to see in the flesh is making the products sell themselves. We started out by fitting that awesome looking TJM T13 Outback bar and had it colour coded to match the factory colours. TJM has both a bumper cut and full bumper replacement bar available for the new 200 but we couldn’t steer away from the look of the bumper replacement bar. It has rated recovery points built into the bar and uses 63mm tubbing for that chunky look and the ultimate protection. 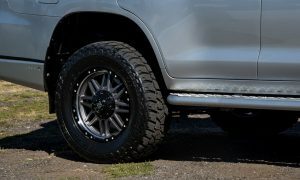 A set of 63mm brush bars and side-steps compliments the bull bar and we’ve also blended them with the Toyota’s factory paint. 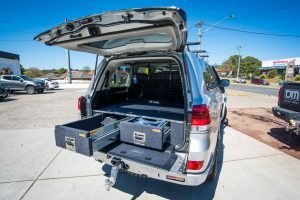 There’s a Kaymar rear bar without out any wheel carriers that offer plenty of protection with ease of access to the rear tailgate and TJM underbody protection to finish out the armour. 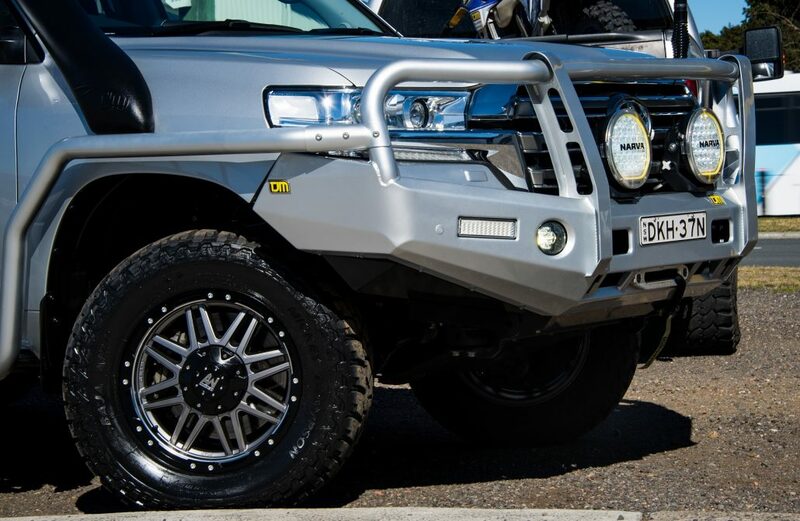 The bull bar houses a 12,000lbs TJM synthetic rope winch with a Factor 55 hook to take care of recovery duties and a TJM Airtec snorkel feeds clean air into that thumping big twin turbo diesel V8. The 200 Series as plenty of power off the shelf but when it comes to towing or having the vehicle loaded up to the hilt you can never have too much under the bonnet, so we’ve gone the full Torqit treatment on the 200 including the twin 3”stainless DPF back exhaust system, power module and pedal torque module. This has given the big wagon over 250kW of power and over 860Nm of torque at our disposal and with no shortage of power anywhere in the rev range – this big 200 pulls like a freight train. Engine protection comes care of a HPD billet alloy catch can and a Diesel Care pre-fuel filter kit. There’s also a TJM Airtec snorkel to force feed some cleaner, cooler air straight to the intake and the lower profile of the Airtec keeps the snorkel head down and out of harms way on tight, overgrown tracks. But there’s no point having all that power if you can’t get it to the ground! We’ve opted for the Fox Racing 2.5 Performance Series struts on the front and Fox 2.0 Performance Series shocks with TJM 300kg raised coils on the rear. The front has come up 2.5 inches on the front and 2 inches on the rear fiving it a nice level stance. Correction components include Black Hawk upper control arms and a Roadsafe diff drop kit. We’ve recently added a set of Allied Wolf alloy wheels which measure 18×9 and a +35 offset which really suit the overall styling and colour scheme on the 200 and are built tough to cope with any off-road abuse. 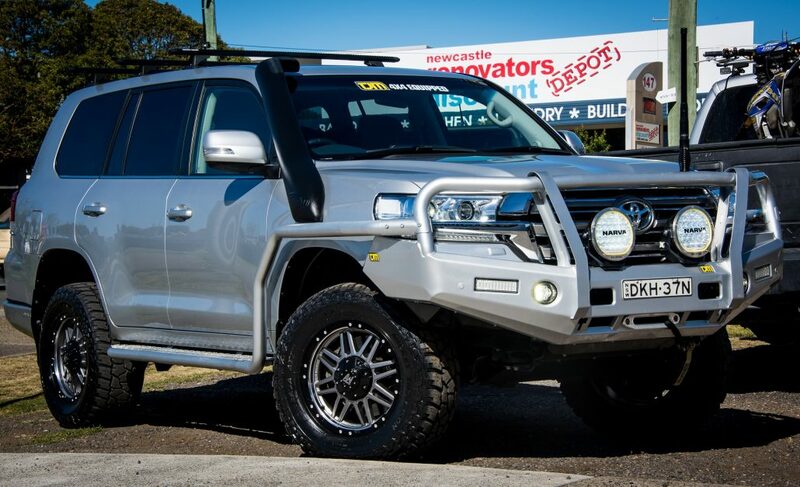 They are wrapped in a set of Mickey Thompson ATZ P3 all-terrain tyres which measure 305/65 x 18″ for getting the massive amounts of power to the ground. Power needs are taken care of by a TJM 25 amp BCDC dual battery system running a deep cycle battery. The interior has been fitted out with a set of RV Storage Solution rear storage draws and Autosafe cargo barrier to optimise the large cargo area in the 200. 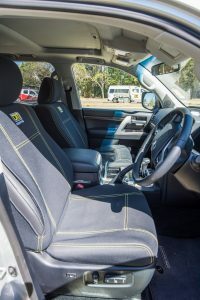 There’s a GME XRS UHF fitted with a GME 3dbi gain antenna for communications and a set of TJM Wetseat seat covers. The TJM 200 Series is currently fitted out with a set of Narva 215 LED driving lights and a Rhino 3 Rack roof rack system. 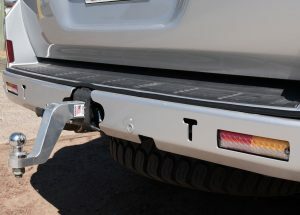 A Hayman Reece tow bar fitted with a Titan RV 6 inch alloy drop-down hitch for towing. With power, comfort and now a host of awesome upgrades- this 200 is definitely a company car with a difference.